Air Canada Rouge is showing non-stop flights in December 2017 and January 2018 from Toronto to San Diego for $348 CAD roundtrip including taxes. There's currently a few flights available over Christmas if you can depart on December 20th. 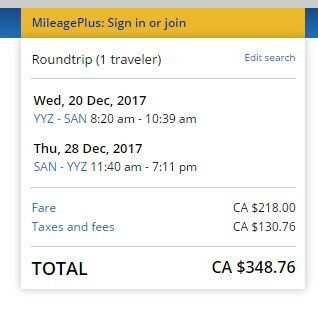 Click on the departure date box to open up the calendar view and browse for the date combinations that are $348 CAD roundtrip. 2. Select your flights and click through to the United Airlines website for booking. United Airlines offers completely free cancellation up to 24 hours after booking, giving you a bit of time to decide.